See this post for explanations and more information. If you spend 1d6 turns creating a Magic Circle and expend this spell on completion, the spell effect is centered within the circle, but lasts for hours instead of turns. If the circle is physically broken (this cannot be done by targets of the spell, but could happen accidentally...), the spell ends. Your name is inscribed somewhat gaudily on the cover of your spell book in ornate leaf. You can inscribe more, but for now it's just you. Anyone opening your spell book, (who's name is not featured on the cover, of course) takes 1d8 damage per HLSS. If you have this spell prepared, you know who tried to open it and where they are, and you can expend this spell to dye their hands a bright color of your choice for a year and a day. You can spend 1d6 days crafting a magic bottle. It must contain at least a single strand of hair, exactly a single fingernail, and no more than three drops of blood from a specific Magic-User. Any spells cast by this magic user against you receive a +3 to Saving Throws (or Advantage in 5e). You may have only one bottle at a time. At your option, you can also smash the bottle, expend this spell, and choose to become invisible to the subject for 1d6 turns. While you have this spell prepared, you can place your dagger on a flat surface. In 1 turn it will point to the direction of the nearest and strongest concentration of Evil or Good (this is randomly determined, you cannot specify which). If you expend this spell while attacking with your dagger, and the target is Good or Evil, your dagger inflicts double damage for this attack. Any familiar you acquire is fiercely loyal to your ethical outlook. Step up it's damage die against any foe that doesn't share your alignment, and it fights as a HLSS HD creature. It understands your Alignment Language, and as long as you have this spell prepared it can speak it. It likes to have its belly scratched and being told its a “Good” familiar (whatever that means). 1. Staff Feature: Cipherstick – Your Staff functions as a skytale, and you can carve corresponding sticks for decipherment. Once enciphered, any text is utterly immune to translation via Read Languages or other magic short of Wish (only your staff, or sticks you've carved can decode it), if you cast this spell while transcribing it. 2. Dictating Quill – As long as you have this spell prepared and a special writing quill from the feather of a creature of at least 4 HD (let's drive these Owlbears to extinction! ), the quill will dictate whatever you wish if provided ink and suitable surface. It is fond of including snippets of your subconscious as commentary in the marginalia. If Scroll Ink (see Read Magic) is used, it might transcribe a spell, but it's helpful footnotes, occasional lacunae, and penchant for obscene acrostics make the resulting spell mighty unpredictable when cast (you must still pay for the cost of the scroll, minus the Scroll Ink discount, but the results when read are Wild Magic). The quills retain their potency for 1d6 months. You can have as many active as your HLSS (they can work simultaneously), and you can make a new one with a fresh feather and a casting of this spell. You start with 1 quill named Nicodemus, from your master's sarcastic dire raven. 3. Bonus Language – When you prepare this spell, you may pick a language you have heard spoken and seen written. You may read and write this spell fluently for as long as you have this spell prepared. You may speak the language (exclusively, no others) for 1d6 turns if you expend the spell. 4. Spell Book Feature: Talking Book – The inner covers of your Spell Book function as a Ouija Board/Spirit Board, including an ornate planchette attached with a silver chain. 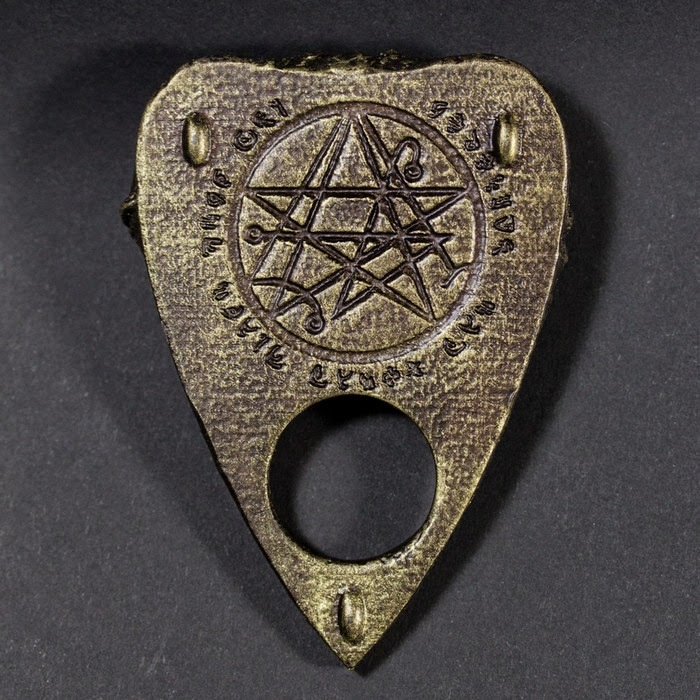 Cast this spell, and up to six literate individuals can use the planchette to communicate via the written word at the same time (starting with a prompt from you), and the transcribed results can be read exclusively by you and all the participants for a year and a day. You might make a lot of money with this sealing secret contracts at cosmopolitan/polyglot ports. Initially found on Propnomicon, apparently from this kickstarter. I wonder if they consulted the board? 5. Jar of Tongues – You have a jar containing the tongue of an individual that speaks 1d4 different languages (at least one is a language you do not possess). Through a disgusting and painful process that takes 1d6 turns, 1d6 damage, and casting this Spell, you can replace your tongue with the one in the jar (your tongue is safe as long as it remains in the jar). You now speak only these languages, although you can always understand your native tongue. You may have as many tongues in the jar as your HLSS, and the grisly process of harvesting a new one takes 1d6 turns of careful cutting, alongside the expending of this spell. The tongue need not be “fresh,” but harvesting the tongue of a live creature does inflict 1d6 damage. Any tongues acquired in this fashion speak the languages their owners knew. 6. Voracious Reader – You can read the written word uncannily fast when you have this spell prepared. Fully comprehending up to 100 pages in 1d10 rounds. For larger tomes, round the total pages to the nearest die, and it will take that many turns (400 pages = 1d4 turns, 840 pages 1d8 turns, etc). If you absolutely must confirm if the butler did indeed do it, you may expend the spell to convert rounds to seconds and turns to rounds. Attempting this on magical texts is a very bad idea.